There’s no set Camino training plan required in order to complete your journey. 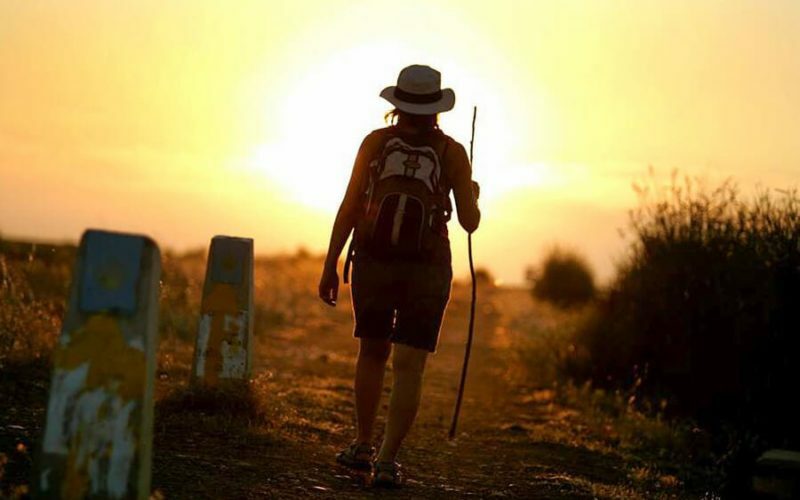 The Camino de Santiago is an all-inclusive experience that welcomes people of all levels of fitness. At the end of the day, the physical challenge of the Camino is about making it to Santiago de Compostela. Some people take longer than others and everyone gets there in their own time. The training you might undertake is also dependent on the stage of the Camino that you are planning to walk. For example, you will need more practice to cross the Pyrenees than the Meseta (a relatively flat area in the middle of the French Way). Any preparation before your departure date will be a massive benefit to you during the journey and will also reduce the chances of injury. An important thing you’ll need to consider for walking the Camino is your footwear. You can either wear hiking shoes or boots depending on your personal preference. Boots are typically heavier and may be uncomfortable for some, particularly in the summer and while walking on more level sections. We recommend using lighter hiking shoes or even trainers on the Camino pilgrimage as they are light, durable and discrete. Hiking shoes will also last 2–3 years so are definitely worth investing in. The best way to begin your training is really just to start walking and go from there. A good time to get your programme started would be about 3 months before your walking holiday. 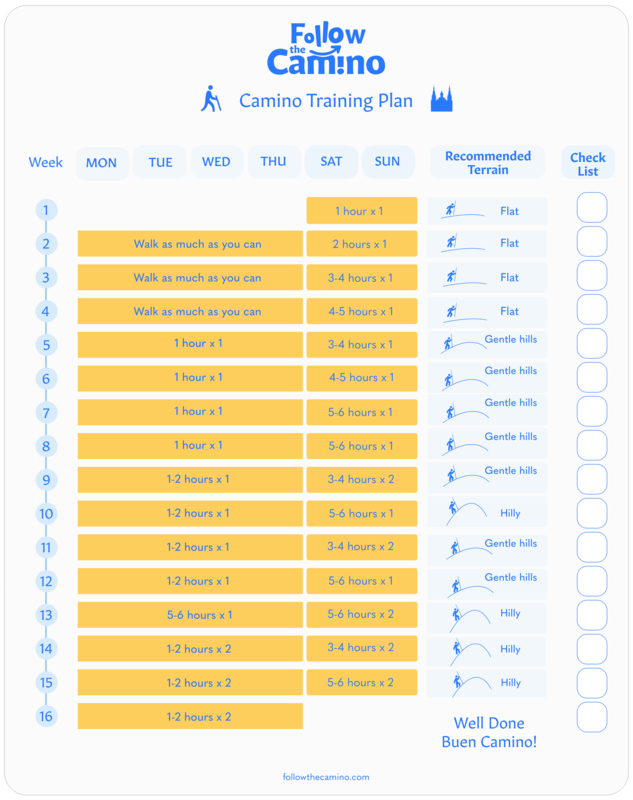 Here’s a PDF version of the Camino Training Plan that you can use to get started. Check out the essential items you’ll need to bring when Packing Your Bag for the Camino de Santiago. Start as soon as you can, the more training you do, the better you will feel for it when out on the Camino. Gradually increase the distances you are walking. You don’t need to do this on every walk, but at least once a week. If you’re getting walking shoes, make sure to wear them as much as possible to ensure they are well broken in before your Camino. Listen to music. It really helps the time go by and can help keep you motivated. Walk with a friend. This lets you spend time with a friend catching up whilst also getting your Camino training in. Use an app or fitness gadget to keep track of your progress and to keep you motivated as you see the number of steps you walk add up. Choose different routes so you don’t get bored. This will also help you to tackle different terrains. Pick a time of day that suits your schedule so you can more easily stick to your Camino training. Listen to your body when walking. If your shoes are pinching or rubbing next time you wear them you should use a blister plaster as a preventative measure or try different socks. Find a walking group – in most areas you can easily find a walking group to join. Have a quick search online to find one near you. It’s also a great way to meet other people that have similar interests. If you’re in Ireland, check out our Events page to see when our next Camino Training is happening. 1. Weight loss – walking is an easy way to start burning calories. 2. Lowers blood pressure – walking is an easy, drug-free approach to help lower your blood pressure. 3. Strengthens bones and joints – walking is a gentle exercise that helps strengthens your joints. The more steady you are on your feet the less likely you are to fall, particularly in older age. 4. Reduces the risk of heart disease – when you’re walking, the heart will become more efficient at delivering oxygen to the muscles. Like all muscles, they benefit from exercise. 5. Reduces the risk of diabetes – walking means you are using your muscles more which in turn means that they are using more glucose. This has been shown to lower your blood sugar levels. 6. Good for your mental health – walking can allow you time for your mind to relax which in turn will improve your mood. 7. Improve your balance and coordination – as mentioned, walking is good for your bones and joints which in turn improves your balance and coordination. As we get older, it’s important to keep active so that we’re not easily put off balance or fall and potentially fracture something! 8. Improves sleep – going for a good walk will help you get a good night’s sleep as it will give your brain time to relax and will alsotire your muscles so you’ll be glad to jump into bed at night – even a bit earlier depending on how big a walk you did that day! 9. Get your Vitamin D from the Sun – walking means you’re outside and getting Vitamin D, which your body needs so it can absorb calcium which in turn helps with bone strength. 10. Everyone can do it, just take the first step – walking is very accessible, you just need to start. Try getting on or off the bus a stop earlier, take the stairs when you can, or leave the car at home and walk into town. 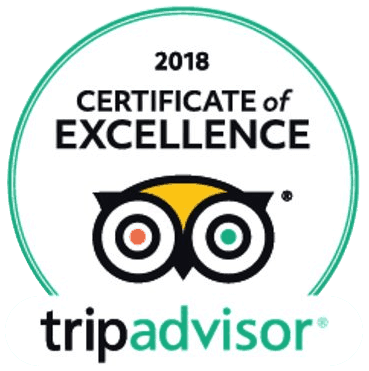 Feel free to contact us at info@followthecamino.com for any questions you have on the Camino tours.